Who wants to be a Millionaire? Everyone! May 20th is Be a Millionaire Day, and what better way to celebrate than by working towards joining the Millionaires Club. I’m a huge believer in building wealth, especially when starting young. But it’s possible to become a millionaire at almost any age, so let’s break it down. First, you simply have to pay off your debt. You’ve got to get from a negative net worth to a positive net worth. The wrong kind of debt can hold you back from making progress on your financial goals. If you have any type of consumer debt you should make a plan to pay it back as soon as possible. Once your debt is paid off you can then funnel that money toward your investments. As time goes by your investment strategy needs will change. Make it a habit to review your investments and look for ways to improve them. Maxing out your retirement account each and every year is one sure-fire way to enter retirement as a millionaire. If you don’t already have a 401k open meet with the HR department at your workplace and have one set up. You should contribute as much as you can (up to the maximum contribution amounts) or at least enough to receive an employer match if applicable. If you already have a 401k make a plan to increase your contributions as much as possible each year until you’re maxing it out. What if your employer doesn’t offer a 401k? No problem! You can still open a Roth IRA, Traditional IRA, or if you’re self-employed an SEP IRA. Not having an employer sponsored 401k is no excuse to skip investing for retirement. You should continually increase your contributions to these accounts as well. While you may have started out with the perfect asset allocation it will change overtime as your assets increase or decrease in value. Review your current portfolio to make sure that your investments are currently correctly weighted based on your strategy and risk tolerance. Make adjustments if needed. You should do this at least once a year to stay on target with your investment goals. Check out our guide on how to rebalance your portfolio across multiple accounts. 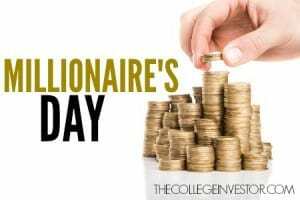 Investment fees can keep you from becoming a millionaire. They can seriously erode your ability to make a decent return investing. Check out the free tool FeeX, which will analyze your portfolio and make recommendations about funds and ETFs that may be costing you too much in fees. Oh, and the best part? It’s free. All millionaires invest in themselves. While it is crucial for you to develop a smart retirement plan that includes a mixture of assets such as CDs, stocks, and bonds, it’s just as important to invest in yourself. After all, YOU are your most valuable asset. If you’re looking for some lower risk investments to add to your portfolio a Discover Individual Retirement Account CD is a good example. You can choose from either a Roth or Traditional IRA CD and it has no monthly maintenance fees. A Discover Certificate of Deposit is another great option with flexible terms from 3 months to 10 years and you can open your CD account with as little as $2,500. Finally, always be checking to see if you have the best brokerage account to meet your needs. Check out our Brokerage Comparison Tool to find out if you could save. One of the quickest ways to immediately have more money to save and invest is to lower your expenses. Review your budget and make cuts where appropriate. I would caution you to take budget cuts slowly so the habit will stick. If you try to make too many changes at once you’ll end up quitting too soon. Food – Saving money on food is by far one the easiest ways to cut your budget. You can do this by eliminating take-out, creating a menu plan, preparing meals ahead of time (freezer cooking,) and shopping sales. Cell Phones – Cell Phones are another one of those guilty pleasures that people normally spend way too much on. The fact of the matter is you can get a pay as you go phone with same features as your contract smartphone for about a third of the price. There is a significant amount of savings to be gained just by switching out your phone. Housing – Housing is one of the hardest budget cuts to make but it’s also one that can have the most impact. By downgrading your housing situation and saving hundreds to thousands of dollars per month you’ll be able to quickly accelerate your millionaire status. Transportation – How much money do you spend on a car payment and insurance each year? If you’re not already financially stable, selling an expensive, gas guzzling, high insurance car and swapping it out for an older model that you can pay for upfront can save thousands of dollars per year. Insurance – You can normally save money on car insurance every 2-3 years just by switching companies. Don’t be afraid to call your agent to get quotes from multiple insurance carriers. Clothing – Thrift shops and consignment shops are great places to get clothes. There are even high end consignment shops online now making it extremely convenient to get nice, name brand clothes for a fraction of the retail price. When cutting your expenses do the best you can do. We’re all in different situations so there’s no one-size-fits-all situation. Remember, we’ve put together a list of ways to save over $500 per month. It’s possible – I’ve done it. While cutting your expenses is the quickest way to free up extra money in your budget it’s also a very limited route. If you really want to fast track your way to millionaire status you need to work on both sides of the equation. That means you need a plan to increase your earnings. Ask for a Raise – This is a simple yet effective solution. If you’ve been with your company for at least a couple of years and have proven your value a pay raise might be in your future. Meet with your boss explain the value you provide and why you feel like you deserve a raise. The worst you’ll be told is no. Switch Jobs – Another option is to switch jobs altogether. If you’re underpaid for your position and aren’t happy with your employer you can start looking at alternatives. Offer Freelance Services – Everyone is knowledgeable in a certain area. Why not take that knowledge and offer it as a freelance service? Start a Side Business – Starting a side business is personally my favorite way to increase income. Your options are limitless and you get to pick something you enjoy. Here are fifty side hustle ideas to get you started. Behind every good goal is a strong reason. 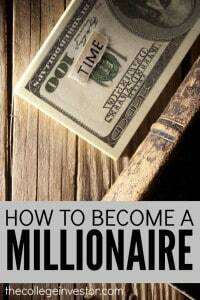 Figure out why becoming a millionaire is so important to you. Do you want to be financially free? Retire early? Or just have some peace of mind? The reason behind your goal needs to be strong so that you see everything through. Make a practice of writing down your goals every day. This will help prevent you from backsliding. If you want to become a millionaire you need to create millionaire habits. This means living below your means, increasing your earnings, ridding yourself of debt, and most of all, making smart investments. Start mapping out and working your millionaire plan while you’re young and you’ll be able to meet or exceed the millionaire mark down the line. What tips and tricks do you have to become a millionaire at any age? This article was sponsored by Discover, but all thoughts and opinions are my own.